iotop does for I/O usage what top does for CPU usage. It watches I/O usage information output by the Linux kernel and displays a table of current I/O usage by processes on the system. 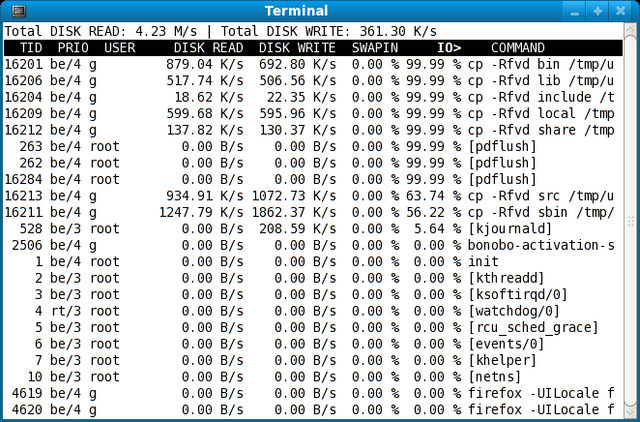 It is handy for answering the question "Why is the disk churning so much?". iotop can only run under a Linux 2.6.20 or later kernel built with the CONFIG_TASKSTATS, CONFIG_TASK_DELAY_ACCT, CONFIG_TASK_IO_ACCOUNTING and CONFIG_VM_EVENT_COUNTERS build config options on. HOW DO I INSTALL IT WITHOUT UBUNTU(GASP)?